Tremendous Team Effort Wins Us Four Out Of Four! It was cold, but a bit sunny, at 3.15 in the afternoon of Thursday 25th February 2016. We had a strong team consisting of Issy, Teddy, Isaac, Harriet, Grace, Elliot, Charlie, Jacob and Oliver! We had a chance - different year groups compared to our normal team of all Year 6s! Our team warmed up and then it was time to play our first opponent: Kingston St Mary; last year we lost to this team by a long way, but things were about to change! Match 1 WE WON! 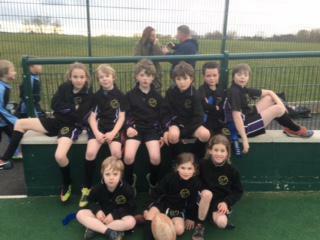 And our first ever rugby match won against one of the strongest teams! For this game “Man of the Match” went to… Elliot for being very respectful and having self belief. During the game he was being called names but he didn’t retaliate! Elliot also believed he could score and he did – 5 of them! Match 2 This match was against Norton Fitzwarren – our rivals! Who would win – CrowStog or Norton??? WE WON! This gave our team the self belief to try and will all 4! At first we thought we won the first game by fluke! But obviously not! The Girl of the match goes to Harriet for setting up for some awesome tries, tagging, helping and cheering. Match 3 Our third match. Could we win?? WE WON! Against Cotford St Luke, we won by a respectful 5-3, but they played brilliantly (the best team that we played actually!). Our second to last Man of the match goes to… Teddy for scoring the winning try and… being very determined. Match 4 This was the match to see if we could win four out of four. It would be hard…but we could do it. We are from Crowcombe and Stogumber - we can do anything! WE WON! WE WON! For the first time ever! We had won all 4 games! Every one was so happy. Last year Hatch Beauchamp beat us by loads but we beat them back 4-2. My final man of the match goes to… Charlie for being respectful, determined, concentrated, honest and for showing great teamwork. But to win all 4 matches the whole team would have to show teamwork. So the men and women of the match award goes to…all of us! We are all looking forward to our next tournament, on 8th March!